A little while ago, D requested if I could make some 'chorizo' seitan sausages, having enjoyed them the first time round of course I happily obliged. Just a word of warning though, don’t get cocky and over-confident making seitan sausages at home. I wrapped mine too tightly: not did one explode, two explode, but three exploded. Thankfully, they were still all edible. Also upon wrapping with foil, make sure that the shiny side of the foil is on the inside. Anyway, have found these 'chorizo' seitan sausages ever so versatile. 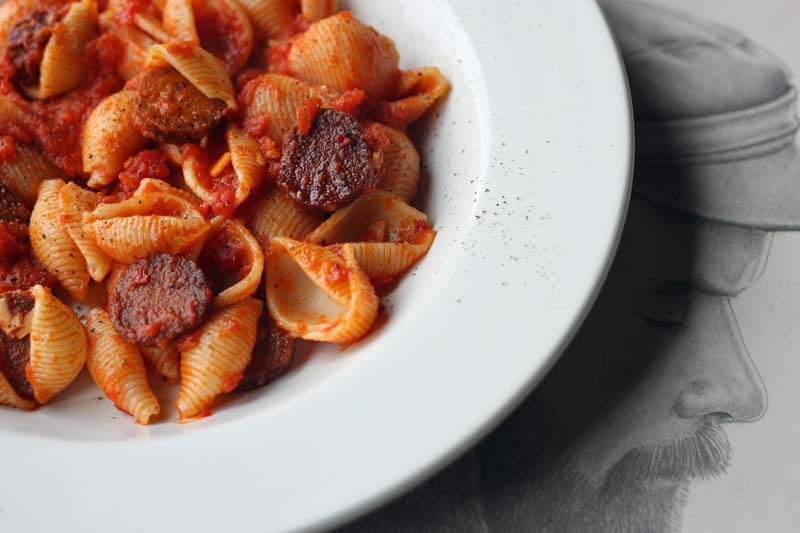 On one day I made this 'Chorizo' Sausage Pasta dish. This pasta dish is essentially an Arrabiata sauce: olive oil, onions, garlic, chillies and tomatoes to which I have stirred in home made 'chorizo' seitan sausages. 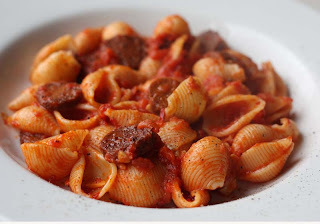 The spicyness of this pasta dish was intensified further by the addition of the chorizo coins. I liked it very, very much. I am submitting this to I am submitting this to Presto Pasta Nights #228. PPN was founded by Ruth Daniels of Once Upon a Feast and each Friday night a different host posts a roundup of pasta dishes submitted by bloggers from around the world. This week PPN is being hosted by honeybunch of The Lives & Loves of Grumpy's Honeybunch. i'm glad the explosion didn't ruin your chorizo. the results look really good to me! I would love to try Vegan Chorizo. This vegan pasta dish is fantastic! Love this! I haven't made a lot of my own seitan lately but have done so in the past - and used to make it on a weekly basis when I was a stay at home mom! However, I happen to have some in my freezer that I found in the store, so I will definitely be using it in one of my next pasta dishes. Thank you for participating in PPN! Well, I am fascinated with the vegan chorizo! And the pasta dish looks fabulous too! Yeah so am I - other wise all that work gone into making them would have been disappointing! I've seen ready made Vegetarian Chorizo being sold in Holland and Barrett, so maybe you should check it out! I've been made unemployed a little while ago, so am finding a lot more time on my hands to play in the kitchen. Its a vegan 'meat' substitute. I'm not vegan, but more into my vegetables, but sometimes do like to eat something with a bit of texture. Yum, my dad used to make a similar dish when I was younger, only with actual meat, spicy tomato sauce and sausage used to be one of my favourites. I'm going to try and make this at the weekend! Please do let me know how it works out for you and how you find it.